With your support, the Jamaica Foundation of Houston had an exciting year! Your involvement and donations supported our fundraising efforts for scholarship and community service initiatives. Events including the White Party, Scholarship Luncheon, Gala, Picnic, and Christmas Party helped to generate funding in support of our mission to promote cultural understanding, education, and volunteerism. 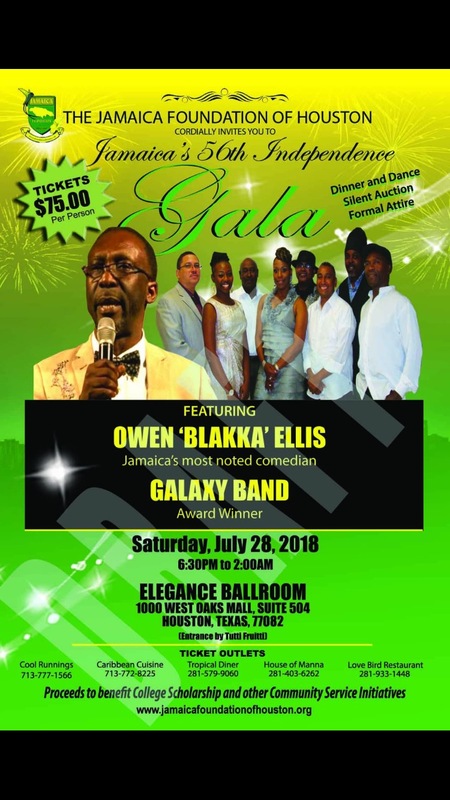 Thanks to Cool Runnings and Ditty Island Delights, as well as Caribbean Cuisine, Tropical Diner, One Love Caribbean and other area businesses and individuals for your contributions to these events and more. Not only has your support helped us with scholarship and community service events, but it has contributed immensely to our Disaster Relief Effort; your donations helped Jamaicans and Houstonians affected by Hurricane Harvey through 2018. We started the year with our third Annual White Party. The fundraising event, hosted at Cool Runnings and supported by Ditty Island Delights, helped us raise funds for scholarship. Each year, the Jamaica Foundation of Houston’s Scholarship Program provides financial assistance, based on academic performance and family financial need to college students. Through the years, from the inception of the Scholarship program in 1985, the Jamaica Foundation and it’s predecessor organization has awarded more than 165 scholarships. Recipients have gone on to graduate and become respected professionals in their chosen communities. Thanks to our local musical entertainment–The Galaxy Band and our very own DJ Paul Notch. We also express our appreciation for Randall’s continued support with annual donations of beautiful floral centerpieces for our gala. Beautifully displayed auction items from various donors helped us raise funds as well—thanks to donors including The Breakfast Klub, Daley Naturals and the Airlines. Through partnerships with various organizations including the Association of Jamaican Nurses and the Houston-Missouri City Domino Club, we were able strengthen cultural ties in the community this year. The Domino Club’s attendance and support at our annual gala was well felt. Our Jamaican pride shone during the cultural performance by members of the Association of Jamaican Nurses at the gala. Other Caribbean organizations showed their full support of the foundation by attending our gala as well. Our celebration of Jamaica’s 56th year of independence culminated in our annual church service on August 5th held at Windsor Village United Methodist Church this year, with a Taste of Jamaica for individuals to learn more about Jamaica and the foundation. There is much to be grateful for and much to look forward to in 2019. There is new energy, new direction, and sense of community for the Jamaica Foundation of Houston! Our new direction includes increased membership, member and sponsor benefits, youth leadership, academic scholarship, fundraising, and other efforts. We invite you to join our organization and participate on committees based on your interests or needs, if you have not already done so. With your support, we can build a stronger sense of community. Learn more about how you can support the foundation at our first general meeting on January 18 of 2019 at 6:30 pm, held at the Tracey Gee Community Center in Houston’s Westchase District—view our General Meetings page at jamaicafoundationofhouston.org for details. On behalf of the Board of Directors, members and volunteers, I wish you happy holidays and thank you for being an essential part of the Jamaica Foundation of Houston.